The 2085 Nurit is an advanced and truly compact credit card terminal swiper with a fast printer supporting credit, debit, check, and EBT. The point of sale Nurit 2085 is exceptionally user friendly and very fast due to the thermal printer that eliminates the need for ribbon replacement. The Nurit cc terminal has large, high contrast alphanumeric LCD display and menu-driven software, together with four programmable function keys, allow the user to access every feature of the terminal easily and quickly. The Nurit credit card machine can hook up to various pinpads including the Verifone pinpad 1000. 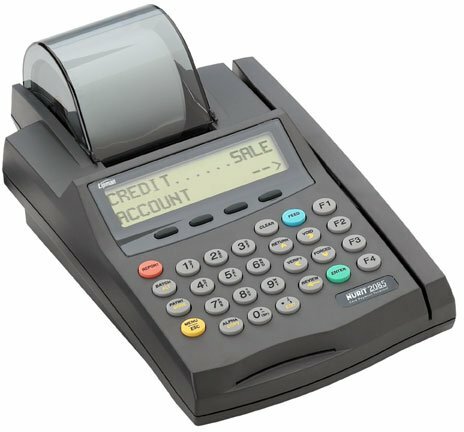 The 2085 credit card processing machine scanner is great for restaurant merchant accounts for your restaurant credit card processing.